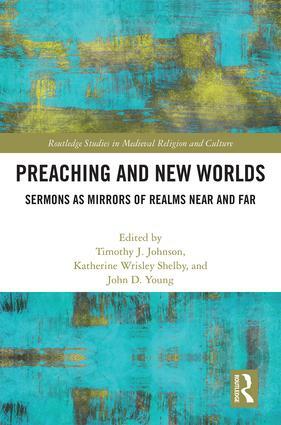 This collection of essays examines the polyvalent concept of "New Worlds" in the context of medieval and early modern sermon studies. While the terms "Old World" and "New World" are commonplace in studies of Europe and the Americas, this volume explores how preaching in the Atlantic world and beyond creatively engaged audiences in addressing new cultural and religious perspectives regardless of their geographical location and time period. The identification of the "other" in sermons is already an implicit recognition of a novel world, which could be equally enticing and intimidating. The scholars represented in this volume examine a wide panorama of medieval and early modern efforts as they identify how sermons, which often served as a highly effective media of mass communication, reflect shifting identities, sometimes contested and sometimes embraced, within long-standing traditional constructs. Particular themes include apocalypticism, art and mission, cultural interaction, multilingualism, forms of religious life, and theological innovation. Timothy J. Johnson is the Craig and Audrey Thorn Distinguished Professor of Religion at Flagler College. A Senior Fulbright Scholar and Chair of the Research Advisor Board of the Franciscan Institute, his more recent publications include the coedited Ordo et Sanctitas: The Franciscan Spiritual Journey in Theology and Hagiography, Brill, 2017, and Franciscans and American Indians in Pan-Borderlands Perspective: Adaptation, Negotiation, and Resistance, Academy of American Franciscan History, 2018. Katherine Wrisley Shelby graduated from Flagler College with a BA in English and Philosophy/Religion and holds an MTS from Harvard University. She received a PhD in Historical Theology from Boston College with her dissertation on "The Vir Hierarchicus: St. Bonaventure’s Theology of Grace." She is the coeditor of Bonaventure Revisited: Companion to the Breviloquium, Franciscan Institute Publications, 2017, and has published several articles in the area of Franciscan theology. John D. Young is the Kenan Distinguished Associate Professor of Liberal Education and History at Flagler College. He has been a visiting professor at the University of Würzburg and a research fellow at the Research Centre for the Comparative History of Religious Orders University of Dresden. His previous publications include the coedited volume Standing Apart: Mormon Historical Consciousness and the Concept of Apostasy, Oxford University Press, 2014.